Airlines and airports are going pink to promote Breast Cancer Awareness month. Throughough October, Tampa International Airport is lighting up its SkyConnect stations in a shade of pink. TPA’s Guest Service Representatives are all wearing pink scarves and ties and airport police officers are wearing pink ribbon-adorned badges. Miami International Airport is also going pink during October. Travelers will see pink signage on MIA’s Central Boulevard welcome sign, flight information screens, ticket counter monitors and more. Last year, the Miami-Dade Aviation Department (MDAD) raised more than $35,000 for the American Cancer Society’sMaking Strides Against Breast Cancer (MSABC) Walk – the most of any Miami-Dade County department – through employee-led food sales, raffles, auctions and activities. This year, MDAD has partnered with concessionaires at Miami International Airport to raise more than $16,000, with the goal of surpassing its 2017 total. Airlines are also going pink. To raise awareness and support for breast cancer research, Delta Air Lines employees will wear pink uniforms and sell pink products, including pink lemonade and pink headsets, on board and in Delta Sky Clubs throughout the month of October. This year, customers can also purchase Pink Boutique merchandise through the Pink Boutique online store. Proceeds from the onboard sales and online Pink Boutique benefit the Breast Cancer Research Foundation’s research projects and the overall mission of finding a cure. Delta will also donate 10 percent of all on-board sales directly to BCRF during the month of October. AAdvantage customers can receive 20 AAdvantage miles for every $1 donated to Susan G. Komen with a minimum donation of $25 from Oct. 1 to Oct. 31. Team members who are survivors of breast cancer will be prominently featured on aa.com, on AA flight and gate information display screens and in Admirals Clubs. On planes, there will be pink beverage napkins and pink inflight menus, amenity kits, Wi-Fi portal and more. Passengers will also be invited to donate directly to Susan B. Komen during flights. flight. Other airlines and other airports will be marking Breast Cancer Awareness Month as well with fundraising efforts, information campaigns and lots of pink. If you know of a campaign, let us know. Alaska Airlines joins the list of airlines adding extra flights to Las Vegas for CES 2019, the big electronics show. Alaska Airlines is adding 40 additional flights to Las Vegas from west coast tech hubs in Seattle, San Francisco, Los Angeles and San Jose for people traveling to CES 2019 (the Consumer Electronics Show) next year. The extra flights are scheduled from January 7 to January 12 and represent approximately 6,000 additional seats to and from these cities for that week. While hotels will be very full and hotel room rates may will surely spike during the CES 2019 week, you don’t need to be attending the show to take advantage of these extra flights to and from Las Vegas. But since these flights just got loaded into Alaska’s system, you might want to book them soon. Other airlines are adding temporary flights for these days as well. American Airlines and Japan Airlines recently announces extra CES flights between Tokyo and Las Vegas. Delta Air Lines, which has added CES flighs in the past, will likely announce this year’s batch shortly. Heading to Las Vegas for CES 2019 or some other event? Be sure to make some time to visit the Neon Museum. The museum tells the history of Las Vegas through classic, cast-off neon signs and is a great place to visit in the evening when many signs are lit. American Airlines becomes the latest U.S. carrier to issue renewed and tighter rules for taking emotional support and service animals on board it airplanes. To fly with an emotional/psychiatric service animal, customers must contact American’s Special Assistance Desk at least 48 hours before a flight and provide documentation. American says validation of that documentation will include having the airline contact your mental health professional. Certain types of animals from are now forbidden from flying as emotional/psychiatric support or service animals, including insects, amphibians, reptiles, hedgehogs, goats, ferrets, snakes, spiders, waterfowl, birds of prey, animals with tusks, horns or hooves (except specially trained horses) and animals that have an odor. To fly for free, emotional/psychiatric support and fully-trained service animals must meet the tightened requirements, must be able to fit at your feet, under your seat or in your lap (and if flying in your lap, be smaller than a 2-year old child). And service or emotional/psychiatric support animals will not be allowed to stick out into or block aisles; occupy a seat or eat from tray tables. American Airlines and Marvel Studios agree. So they have joined forces in the Stand Up to Cancer campaign to create a special airplane livery showing heroes from the Marvel Studios’ film Avengers: Infinity War alongside the Stand Up To Cancer logo and images of cancer researchers and American Airlines employees who are cancer survivors. 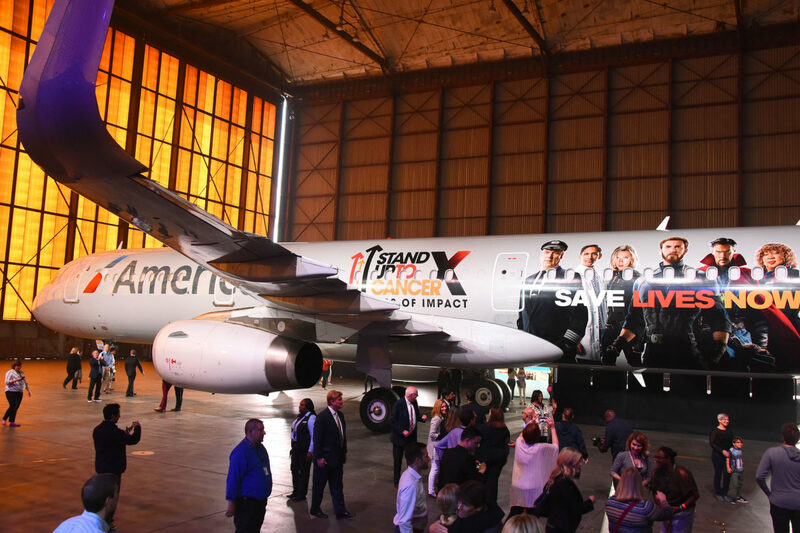 The aircraft was revealed at Los Angeles International Airport on Sunday and will fly between New York and Los Angeles as part of the PSA campaign designed to raise funds and awareness for cancer research and treatments. Want to help? Donate at least $25 to the campaign and you’ll get 10 American Airlines AAdvantage Miles for every mile donated. Details here.